This post will come as no surprise to those who know how much I love luxury hand soaps. Truth be told, I have a bit of a problem when it comes to them ... if, by problem, I mean that I hoard them. At this very moment, I've got about 6 in rotation just in my bathroom alone. BUT, as of late, the only one I've been gravitating toward is Cowshed Grubby Cow Zesty Hand Wash. When I first learned about this one, I was actually a bit turned off by the name. I know that "grubby" is meant to be funny, but it just made me feel like I was going to turn grubby by using it! Luckily, that's most definitely not the case with this product by this fun British beauty brand. Not only are my hands squeaky clean each and every time I pump out a bit of this soap, but they smell fantastic, too. That's thanks to a blend of natural peppermint oil and sweet orange, which, aside from creating a delicious citrusy aroma, work to cool and tone the skin. If you'll excuse me, I'm going to go and lather up. 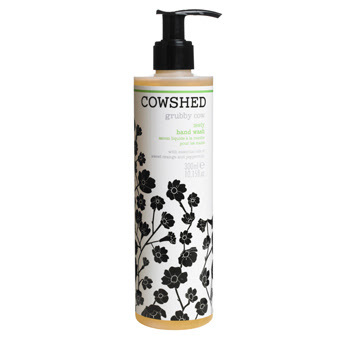 Cowshed Grubby Cow Zesty Hand Wash retails for $22 at cowshed.com. Cowshed Grubby Cow hand wash seems as if it would be useful for those who craft-cleaning the 'grubby' glues, pastes, & paints.